Product #549 | SKU WAVE | 0.0 (no ratings yet) Thanks for your rating! A mouse or pen and tablet is not always the fastest or easiest way to use your colour grading software. Wouldn’t it be better if you had something real to get a hold of? Well, the Wave allows you to do just that. With the Wave we bring a new level of affordability and quality to control surfaces. The design draws heavily on the experience gained from our highly successful CP100 and CP200 panel ranges. The Wave is not intended to replace these panels, it is just aimed at the more budget conscious user. 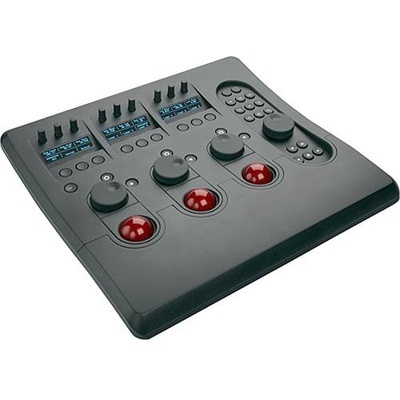 Stylish enough to look good in any grading suite and compact enough to be used for on-set grading, you'll find all the controls you'd expect from a colour grading panel without compromising on the essential ergonomics. The wave features crisp, easy to read, cool-blue OLED displays and custom trackerball units based on a non-contacting optical pickup. With enough buttons and knobs to keep your most needed controls at your fingertips, the Wave will increase your productivity, leaving you to get on with what you're best at doing - being creative! The following software applications currently support the Wave panel. New apps are continually being added so please check back if your preferred product is not yet listed.